• Versatile operation - Eight separate heating elements allow transfers onto a variety of items, such as T-shirts, mouse pads, plates, coffee mugs, ball caps, phone cases, license plates, and many other items. • Full-range pressure-adjustment knob - Easy to access, top-mounted control. This allows the pressure to be adjusted according to the thickness of the material you're transferring to. • Swing-away design - Full 360-degree rotation of swing arm; allows the heating element to be moved safely aside, reducing the chances of accidental contact. • Teflon-coated element - All elements, except the cap press, are teflon coated. is the best quality for your sublimation printing needs. The CISS comes with the permanent chips. 1. 1. Borderless photos up to 13 x 19 inches. * 1 printer USB Cable. If you have any questions about this product by TRANSFER WORLD, contact us by completing and submitting the form below. If you are looking for a specif part number, please include it with your message. 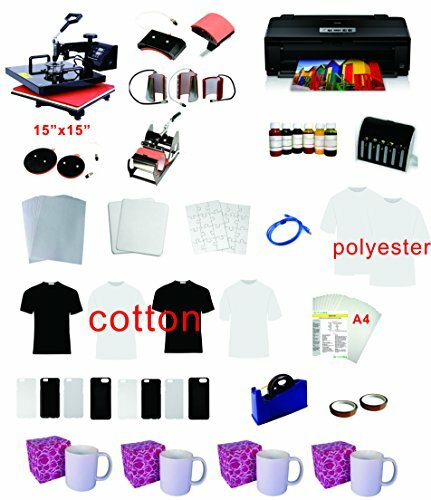 Professional 8 in 1 Multifunction Digital Heat Press Machine Transfer Sublimation T-Shirt Mug Hat Cap 15x12"